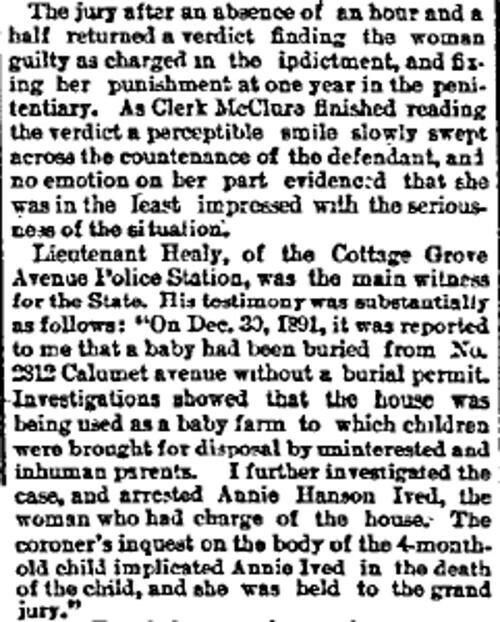 Chicago Daily Inter-Ocean, February 12, 1892. Back in the golden age of “family values,” before contraception, legal abortion and the regulation of adoption, there was a black- market industry dedicated to the discreet disposal of unwanted infants. 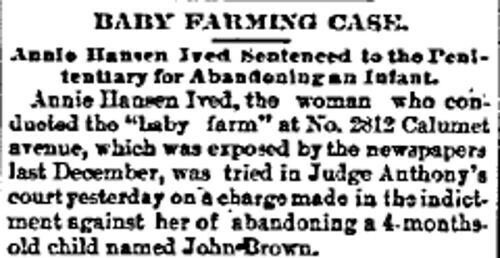 It was called baby farming. That's the racket in a nutshell: an "uninterested" parent or parents handed a baby off to a “caregiver” along with a small payment nominally intended for the kid’s upkeep until such time as he or she could be adopted. In an age of staggering infant mortality, it was no surprise if and when the kid failed to thrive. No way was the coroner's office going to be able to stay on top of all the dying babies, though a lot of baby farmers took the extra precaution of burying their charges unshriven and unmourned. Exposure typically entailed or began with the discovery of a tragic, private little Potter’s field. Note how on one hand the clients of Annie Ived are painted as "inhuman," but on the other hand Mrs. Brown is seemingly getting a legal pass. Maybe she simply cut a deal with prosecutors , but I don't think I've yet seen a legal case in which the clients are getting punished along with the baby farmer herself. 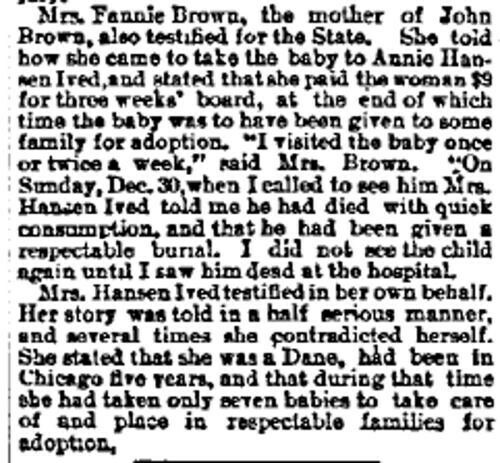 People talk a lot today about the barbarism of Chinese and Third World infanticide, but it wasn’t too long ago that similar practices were common in West, not to mention right here in the Windy City. Baby farming scandals were routine in the U.S., England and France. No doubt it happened elsewhere too, but those were the cases that got reported stateside.